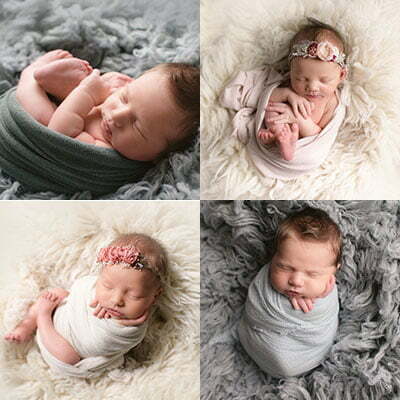 Every newborn sessions starts with a scene. This is the complete look produced by what I photograph against. This can be an organic wool flokati rug from Greece, a solid color blanket with or without textures, or a reclaimed hardwood stage crafted from the original building timbers of 1920's Chicago architecture. Within a scene, I capture multiple angles or poses, and swap out props, wraps, or outfit items like headbands. For every scene you schedule, you can expect between 2-4 different poses or changes to give variety and options in your final gallery. An organic handcrafted wool rug from Greece. Using the world's best New Zealand wool. A simple approach to a timeless image. The infiniti blankets will draw your eyes in to your newborn. While reclaiming Chicago's old-growth timber, this stage adds character and depth to your newborn photos, with a hint of history. 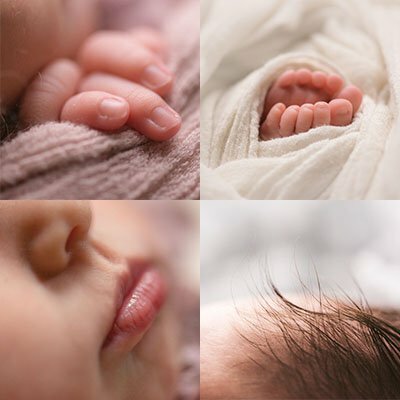 Every session includes macro shots of the smallest features of your baby. These macro shots pair incredibly well with a large format portrait print on your wall.